I’m afraid I’ve got a severe case of expert blind-spot. These sums are so automatic, I’m just seeing the answers without being aware of how I know. Being told it’s a near-double actually slows me down, I think, as I think about which double it’s near. Oh, maybe that’s the point, Robert, that the extra layer of categorization is distracting? I know wha Drake is trying to say. Looking at items #7 and #8, the unknown addend of each are on different sides. In #7, the unknown is on the left side of the equal sign, and in #8, the unknown is on the right side of the equal sign. I have already met adult-age Algebra students who have trouble with this. I posted on your original doubles page because I had to go look up what they wanted your 6-year old to practice. I believe cognitive research demonstrates that practicing the habit of doubles will reinforce the habit and make it more likely the child will us the habit in the future. If the child practices the technique on a problem like 6 + 7 then their is a real probability that they will use that process the rest of their lives. This is, I believe, a disadvantage from instantly “knowing” the answer is 13. I would love to understand why the authors think it is worth the risk to create a life-long bad habit on basic arithmetic operations. Knowing that those exercises are “near doubles” does not change the mental process which I use. Should being aware of the near doubles situation affect how one does these problems? Probably not. The usefulness of that page or lesson is just to help students understand that sometimes a simple addition problem can be handled in two ways. For the simple exercises given, knowing the basic addition facts is most important; recognizing that the addends are near doubles in these exercsies may be helpful, but not necessary; maybe in other more advanced exercises, more helpful. Maybe. In this context I think the idea of “near doubles” is worthless. Either they have automaticity with these facts, or they need a crutch to get there – “near doubles” is not that crutch. And, if they already have their facts memorized, they will disregard what the book wants, and give the automatic answer that your first commenter suggests. 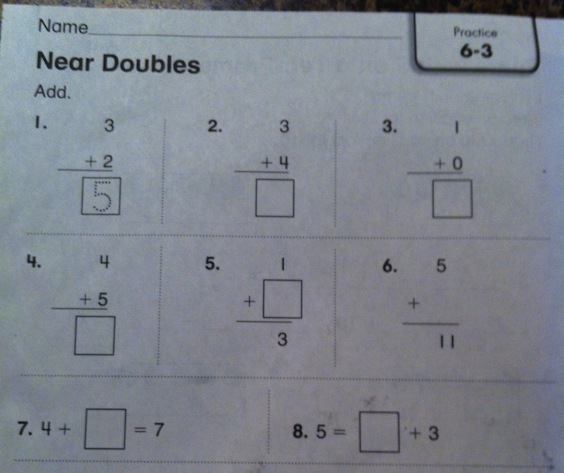 I think the “near doubles” concept is useful in helping children figure out some of the addition facts, such as 6 + 7 or 8 + 9. I might use that strategy myself when adding 200 + 201 or similar. Personally, I have 6 + 7 memorized so I don’t need it with that. But some kids may never memorize 6 + 7 if they become quick enough using this “near doubles” strategy. Personally I would let children practice “near doubles” strategy first with plain additions (not missing addend), so they can get really quick at either using the strategy or memorize the facts. Then I’d have the missing addends later, and at that point children would either use memorized facts, or be hopefully fairly quick at adding so they can guess and check without taking much time with 5 + ___ = 9 or others. 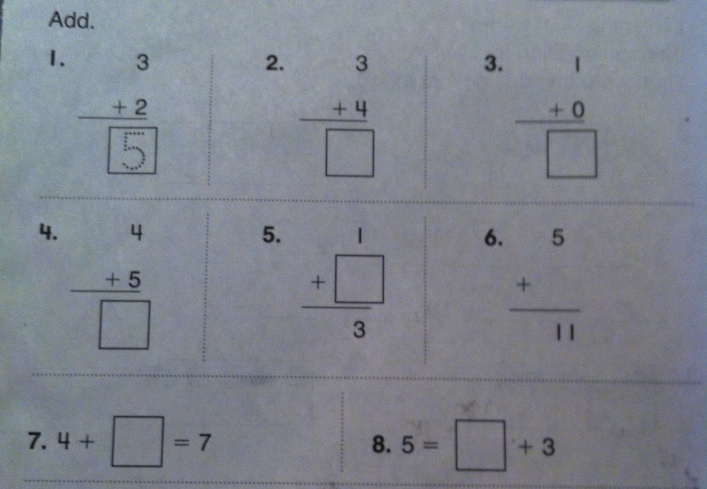 Also, 5 = ___ + 3 may need special attention but maybe that was done in class. I think part of the problem here is that the worksheets are written by strangers and then given to a whole class at a time. But the techniques are best taught in a one-on-one tutoring situation as the child needs them. For instance, the near doubles technique can be useful when a student gets stumped on something like 7+8. Suppose the tutor knows that the student knows 8+8. She could say, “If it were 8+8, it would be easy, right?” and then lead the student to “fix” the answer. And then the student is likely to remember the technique (maybe not immediately, but after fewer repetitions), because it was truly helpful. Using near doubles on small numbers is rather silly, but the book is trying to teach the technique in advance of when it is needed, in hope that the student will think of it when facing a future problem. That is a much less efficient way of teaching. Personally, I don’t find near doubles a technique worth spending time on. My students didn’t need techniques for these little problems—except for 5+6, which is such a natural application of near doubles that it hardly needs to be taught—because plenty of experience with counting led to quick mastery. And for the harder problems like 7+8 or 8+9, I’d rather teach students to make tens. Wow! This idea of “near doubles” is just what I need to master 3826 + 3827 … let’s see, that will be the number that’s between (hmmm, where’s that calculator?) … errrr, 7652 and 7654, which is …. hmmmm, let’s see, I need to average those two and that’ll get me the answer … errrr, this is hard …. to add those two would be, like, doubling about 7650 and dividing that by two, right? So, 3826 + 3827 is roughly 7650, more or less, I guess. Thank goodness for calculators. Much in contrast to young students who are first learning simple addition facts, a few people can do something like 3826 + 3827 in their heads. They may know their own techniques, but some of the rest of us do not know them. At least most of us can align the numbers by place-value columns and perform the addition operation. More of us can learn to keep track of two-digit addends and their parts in order to perform mental calculatons. Try just three-digited 826+827 mentally… notice that you already might know the “26+27” part from experience because you may know by memorization that 27+27=54, and then you just want 1 less. Could you then put this together with the “800 + 800”. Those would have been the techniques I would use, but beyond addition of “near doubles” for three-digit numbers a few of us may not have sufficient techniques for fast mental figuring, but at least a few people do have these techniques. I am saying that both knowing the simpler addition facts is important and that the simple near-doubles technique is also good to be taught. I tend to think that this sort of trick isn’t helpful when children are still learning their math facts, but when I was working with my son this evening, I found that his approach to dividing 60 by 15 (in the context of reducing a fraction) was to realize that 60 was twice 30, which in turn was twice 15; therefore 60/15 = 4. Real-life experiences can lead quickly to some addition and multiplication facts. You pointed to a number for which that applies: 60. What kind of experience commonly uses the number, 60? TIME. Hours, and minutes, and seconds. We look at the clock, observe that 60 minutes can be cut in half, and we naturally examine the clock and find that 60 is made of 30 plus 30. We may examine what happens when this 30 is cut in half, maybe even count the quantity, and find that it is 15. So very quickly, even a first and second grader will learn addition facts for small groups of 60, being in 15 unit increments… 15, 30, 45, 60.